The following is a press release issued by Shinola. DETROIT, MI | November 14, 2017 - Shinola is proud to announce The Canfield Headphone Collection. Designed and developed in Detroit and based in the belief that how it’s made matters, that how things look, feel and sound, matters. The Canfield adds to a range of Shinola Audio goods (Runwell Turntable, Bookshelf Speakers) that are distinctive in every detail. Two years in the making, Shinola’s in-house team carefully tuned and engineered the Canfield Collection with the same rigor and craftsmanship we employ across our growing number of product categories. It was developed with the same high-quality materials, finishes, and processes we use to make our watches, and the sound signature is rich, warm, and expansive. This is an approach to personal listening that’s anything but disposable. The new collection will consist of four styles: The Canfield Over-Ear, The Canfield On-Ear, The Canfield Pro In-Ear Monitor, and The Canfield In-EarMonitor. All will be available beginning November 2017 in Shinola stores, online, and at select domestic retailers. The Canfield Over-Ear Headphones produce a sound that is as vivid as it is clean. Acoustically tuned by our sound engineers and tested in our Detroit factory, the Canfield Over-Ear Headphones use a 50-mm dynamic driver with a neutral frequency response to bring your favorite music to life, providing a remarkably rich listening experience. Featuring stainless steel components, interchangeable lambskin ear cushions, a Top Grain leather headband, and an in-line microphone, the Canfield Over-Ear Headphones allow anyone to experience music the way it should be for years to come. 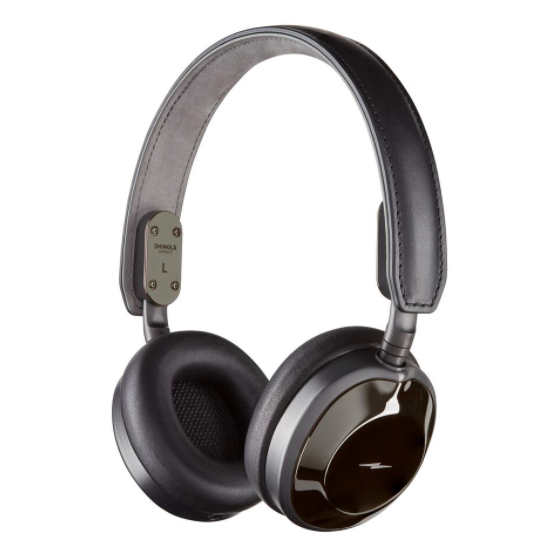 The Canfield Over-Ear Headphones in black and cognac retail for $595 and the Canfield On-Ear Headphones in black PVD retail for $650. Available November 2017. The Canfield On-Ear Headphones are acoustically tuned by our sound engineers and tested in our Detroit factory to emit a clean, precise sound. The best way to listen to your music wherever you might be, the Canfield On-Ear Headphones feature stainless steel components, interchangeable lambskin ear cushions, a Top Grain leather headband, and an in-line microphone. The Canfield On-Ear Headphones in black and cognac retail for $495 and the Canfield On-Ear Headphones in black PVD retails for $550. Available November 2017. Developed and acoustically tuned with our partners at Campfire Audio out of Portland, Oregon, the Canfield Pro In-Ear Monitors are powered by a quad balanced armature receiver to bring out every possible element of your favorite music. Crafted to be endlessly comfortable, the Pro In-Ear monitors allow you to hear your music the way your favorite musicians intended it be heard. The Canfield Pro In-Ear Monitors retail for $495. Available December 2017. Developed and tested with our partners at Campfire Audio out of Portland, Oregon, the Canfield In-Ear Monitors were designed to sound great and be comfortable for hours of use. Featuring memory foam and silicone ear tips and dynamic driver bring to pull out nuance of your music. The Canfield In-Ear Monitors retails for $195. Available December 2017.